We used to eat Tacos regularly here, until we discovered how much salt is in the seasoning mix. 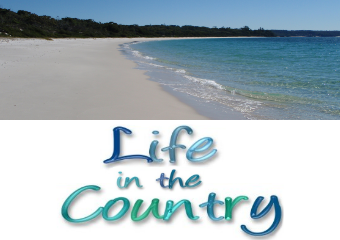 Salt is actually not a problem for me – I have low blood pressure and have been advised to keep my salt intake at a decent level. Salt IS a problem for The Other Half, who has high blood pressure. So Tacos got kicked to the kerb. Greenwell Point Chinese Restaurant make a very delicious San Choy Bow, so I thought I would try to replicate that at home to replace tacos. Just one word of caution though – some of the oyster sauces can be very high in sodium, so my advice is to read the package carefully and pick the one which has the least sodium. 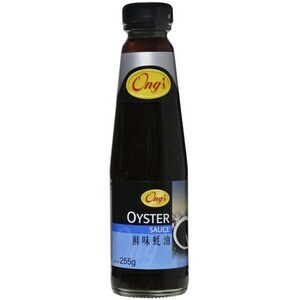 For us, we found it to be Ong’s Oyster Sauce, though being regional Australia we probably have less of a range to choose from. 125mls red wine of your choosing. Tasty shredded cheese to sprinkle on top. 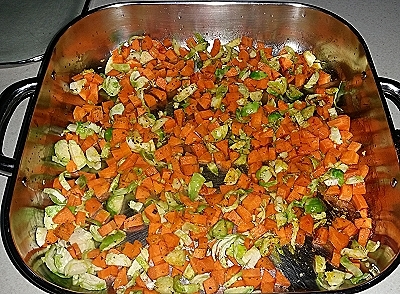 Melt the coconut oil in the pan, and add in the carrots and brussel sprouts. Let them sweat for 5 minutes or so. Then add in the herbs. 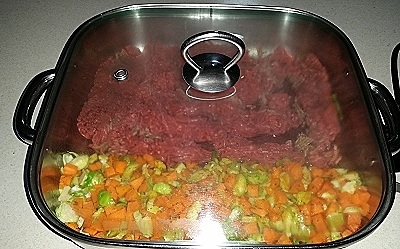 Move all the veg to one side of the pan, and add in the mince. I like to break mine up a little at this point, however The Other Half thinks it is easier to break up if you do *not* do this. Cook your mince, your way! But make sure to pour the red wine over the top and put the lid on so it can simmer. Now put your kettle on to boil and walk away for 10 minutes. Why did we boil the kettle? 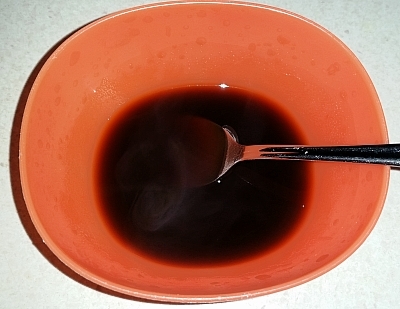 I like to dilute the oyster sauce with 100mls or so of boiling water before pouring it in. It makes the flavour go a little further. Just be careful because it will be very hot once you add the boiling water, as you can see by the steam rising here. 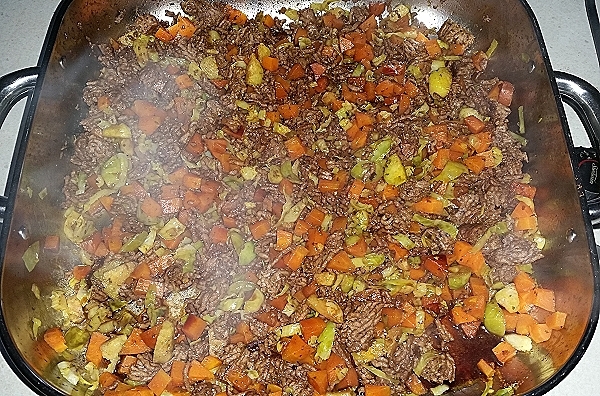 Break up your mince, mix the veg and mince together, pour over the oyster sauce and stir well. You might want to add some soy sauce at this point – we no longer do, as The Other Half seems to be allergic to it. Let it simmer another 5 minutes. You could poach an egg during this time, or fry one, to sit on top and let the gorgeous yolk smoosh into the mince. 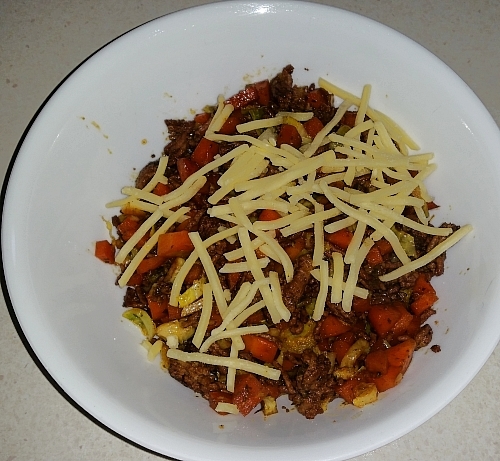 Serve into bowls and add some shredded cheese on top, and you’re done! It might not look gourmet, but it tastes amazing. You can modify this in about 900 different ways, you might like to add different veg, you might want to try a different kind of mince, different spices, different sauces. It is a quick and easy one pan meal which takes maybe 10 minutes of vegetable prep time, and 20-30 minutes of cooking time. If you wanted to serve this to four people, you could put it over rice, pasta, potatoes or sweet potatoes.. 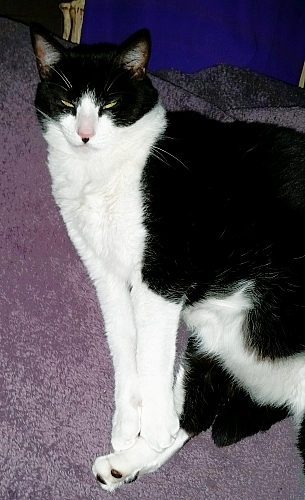 Supervisor kitty was once again otherwise engaged in front of the gas heater. ;) This is getting to be a real problem for me! I don’t quite know how to manage in the kitchen without my supervisor looking over giving me that “Ok, if you really think that will work, but I have my doubts about this plan” improbable kitty face.. Sounds good. So many Asian sauces are heavy in salt but they do give wonderful flavour. Funny about Supervisor Kitty. I made my own version of savoury mince last weekend. The freezer has about five individual serves left after I had one with mashed potatoes the same day and a couple of days later I thickened another serve with gravox, then made it into a pie, but I used frozen store bought pastry, so it wasn’t as nice as when I make my own pastry. Yum! I do like tacos but we dial down the seasoning for that salty reason, who wants to get up for water all night?? Looks delicious! And like a good use of some ingredients I have in my fridge. I’ll have to skip the Brussels sprouts though. No matter what I do to them, I just don’t like them. I see Kitty is laying down on the job again! It sounds (and looks)wonderful! 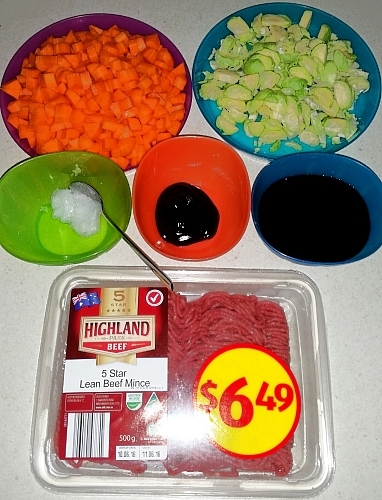 What is beef mince?